Connor Tupponce,19, is a citizen of the Upper Mattaponi Indian Tribe of King William, Virginia and is also an enrolled member of the Chickahominy Indian Tribe of Charles City. He lives in Glen Allen and is a second-year college student at J. Sargeant Reynolds Community College, where he studies business administration. After completing his associate degree, he plans to attend Virginia Tech and study political science and public administration. He serves as a Tribal Youth Representative and in this capacity travels to Washington, D.C. with tribal youth to educate them about the policy side of being native. He and his sister, Emily, run the cultural classes taught to tribal youth. In his free time, Connor enjoys fishing, hunting, and educating himself on wildlife conservation. Please tell us more about both the Upper Mattaponi and Chickahominy tribes. The Upper Mattaponi Indian Tribe is located in King William County, Virginia. We are the people of the upriver portions of the Mattaponi River. Our original village was set to be three miles east of Aylett Landing and was home to the Adamstown Band of Indians. The tribe was not known as the Upper Mattaponi until 1921. The Chickahominy Indian Tribe is located in Charles City County. We are known as the Coarse Pounded Corn People. Our villages were located all along the Chickahominy and James Rivers and were of the first peoples to encounter John Smith and the English in 1607. Are there public events where people can learn more? Both my tribes hold annual gatherings called powwows. This is a time for us to practice our culture in dances and singing while educating the general public about our traditional culture. The Upper Mattaponi Tribe holds their powwow Memorial Day weekend at our tribal grounds in King William, Virginia. The Chickahominy Tribe holds their powwow the fourth weekend in September at their tribal grounds in Charles City. What are some of your favorite childhood memories from the community and activities of your tribes? I grew up practicing my culture through traditional dances and singing. Most of my memories as a kid were being at powwows and seeing friends and family together spreading and teaching our culture. How do you feel about how society values our environment and the Chesapeake Bay in particular? Are we doing enough to protect it for future generations? I feel society today does not understand how much significance the Bay holds not just to those that use it every day to survive, but to those who hold a deep traditional and spiritual connection to it. The Bay is a huge resource to my tribes and our way of life. There can always be more done to protect our environment, there is never enough. I believe that with cooperation between the tribes and the states of the Chesapeake, we will be on the right track to preserving the Bay for many generations to come. Where is your favorite place to play on the Bay? My favorite place to play on the Bay is First Landing State Park in Virginia Beach. This place has been my favorite destination for hiking and fishing ever since my friend Brendan and I discovered it in high school. On any given summer day, you can find us on the beaches of Cape Henry fishing or on the trails along the inlet feeling the dirt under our feet and taking in the scenery that in places seems frozen in time. 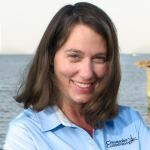 Jody is the director of communications with the Chesapeake Conservancy. She has a public relations background and served as spokeswoman for Anne Arundel County, MD.